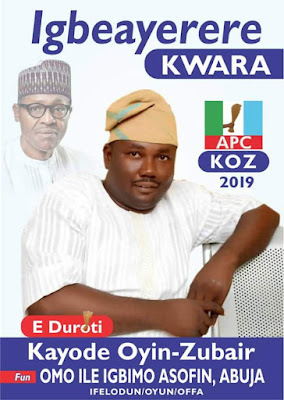 A house of representatives hopeful, Kayode Oyin Zubair has congratulated the Emir of Ilorin, Alhaji Ibrahim Zulu Gambari and the people of Kwara state on the occasion of Eid-el-Kabir and the celebration of the Durbar festival. The astute political activist who is at present member of the Media and Publicity Committee, of the All Progressive Congress, APC, in Kwara, said the season is one to remind us of the lessons of Salah as thought and exemplified by Prophet Ibrahim as well as the need to ensure we imbibe such teachings. While stressing the need to unite in rebuilding Nigeria, he called on Nigerians and the people of Kwara state to rise above partisanship, shun all undue interference and stand firm in their resolve to do what is right for the uplift of the society. While describing the celebration of the Durbar festival as a revival of a traditionally symbolic feature which is long overdue, he noted that this will no doubt position Kwara state in an enviable height among states rich in culture with bright tourism potentials. He urged people to celebrate without disrupting the existing orderliness in the state. He however charged them not to give in to politicians who attempt to use such occasions to make political statements.